If you have a question about which decision you should make, then it can often be helpful to consult the tarot cards. It cannot answer any yes/no questions, but the tarot can help you recognize tendencies. With this spread, two different paths will be shown to you. Ultimately, you will decide which is the better and more coherent path for you. The first path is shown through the first, third and fifth cards. 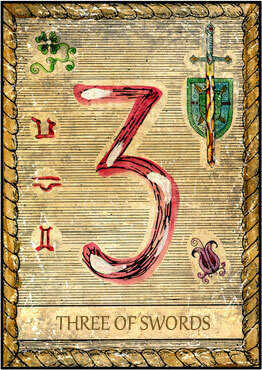 The second, fourth and sixth cards provide information about the alternative second path. The seventh card stands for the initial position of your question. The card number 7 symbolizes the initial position. From this point it becomes clear why this question arised. As first card you drew "The Fool". The main meaning of this tarot card is: Try new things. Acting with ease, alive and unprecedented. To be light-hearted. Beginning of something. Fool.. It generally means: Carelessness, spontaneity and happiness. 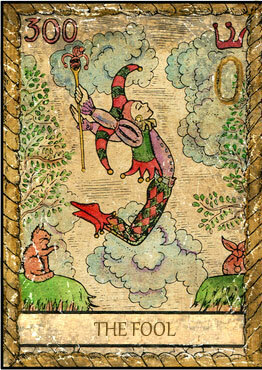 The card "The Fool" also stands for: Lightness, instability, innocence, enthusiasm, betrayal, extravagance, intoxication, delirium, frenzy and ecstasy. Reversed it points to: Negligence, absence, apathy, nullity and vanity. Now you can interpret the upper cards one at a time. Then take a look at the lower path. Which way is the more coherent for you? This is what you decide for yourself. Often one feels much more drawn towards the one than to the other. Listen to your feeling. As first card you drew "The Star". The main meaning of this tarot card is: Youth and beauty. Trust in the future. You have new visions. You are ready to perform.. It generally means: Everything is under a lucky star. Openness and harmony. 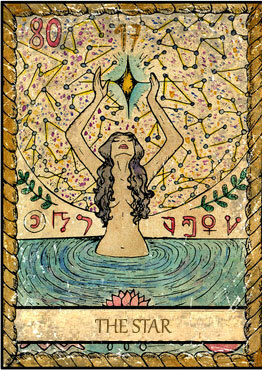 The card "The Star" also stands for: Carelessness, revelation, creation, opportunities, spiritual gifts, hope and optimism. Reversed it points to: Arrogance, vanity, loss, theft, loneliness and impotence. As first card you drew "Strength". The main meaning of this tarot card is: Lust for life. No more fear. Success and recognition. Moral strength.. It generally means: Strength, courage and bravery. The card "Strength" also stands for: Electricity, energy, action, courage, passion, vitality, magnanimity, decency, justice, satisfaction, atonement, reward and righteousness. Reversed it points to: Despotism, misuse of power, weakness, disunity, shame and prejudice. As first card you drew "8 of Wands". The main meaning of this tarot card is: Positive output. Something is in the air. Something glows. Movement comes into play.. It generally means: Good news, activity and speed. 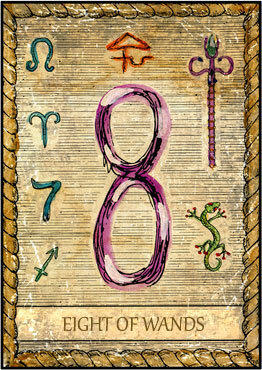 The card "8 of Wands" also stands for: Messenger, great haste, great hope, speed and new love. Reversed it points to: Jealousy, domestic dispute, remorse, marital dispute. 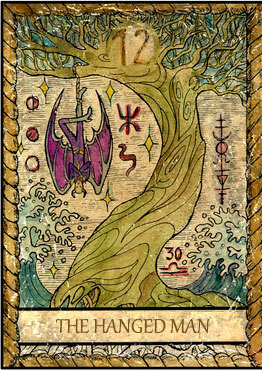 As first card you drew "The Hanged Man". The main meaning of this tarot card is: Feeling helpless. Sacrifice and rethinking things. Bringing light into the darkness. Things are upside down.. It generally means: Peace, reflection and repentance. As first card you drew "The Lovers". 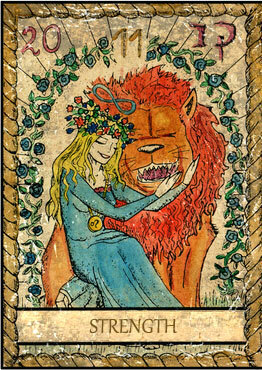 The main meaning of this tarot card is: Decide freely, with a full heart and with a clear "yes". To love and be loved. To overcome differences. A fulfilled life. To endure difficulties.. It generally means: Love, passion and heart. 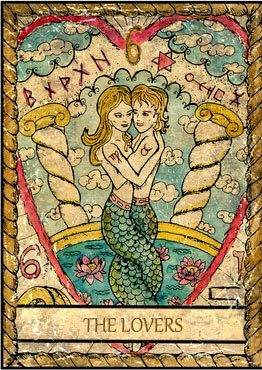 The card "The Lovers" also stands for: Marriage, beauty, fulfillment of desires, trust, temptation, examination, perfection and connection. Reversed it points to: Frustration, adversities of all kinds and failure. The interesting cards in this tarot spread are the 5th and 6th. They provide insights which provide long-term developments. Therefore, the way begins to show itself to you.